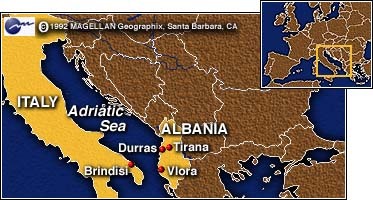 DURRAS, Albania (CNN) -- The first 20 Italian troops on an aid and order mission to Albania arrived in this port city west of Tirana on Friday and were immediately ambushed by a small army of journalists. Outnumbering the soldiers by nearly two to one, reporters and cameramen quickly descended on the troops for interviews as the advance party stepped onto the dock from the Italian transport ship Pantelleria. The vessel left the southeastern Italian port of Brindisi on Thursday night, escorted by the minesweeper Rimini. The soldiers, clad in combat fatigues, chatted warmly for about an hour with the pack of nearly 40 journalists and camera crews, most of them from Italy. Standing on the sun-drenched pier in front of the brilliant turquoise Adriatic, they also handed pieces of candy to local children. The arrival of the first soldiers in the first Italian-led multinational security force is big news in Italy. But only a handful of Albanians, who have been waiting for more than a month for international assistance, were on hand to witness the Italians' arrival in Durras. In a further sign the country was returning to normal, two Albanian daily newspapers have resumed publication. Two independent titles in Tirana put out their first editions in a month on Friday, raising to four the number of dailies that have returned this week after parliament relaxed restrictions on local media.